The Wahoo Tickr X is a heart rate sensor that was used by team Sky in the recent Tour de France 2016 stages (in the Pyrenees, the jerseys are wide open). The Tickr X is Wahoo’s flagship heart rate monitor featuring dual band ANT+ and Bluetooth 4.0 wireless capabilities. The build-in memory can record up to 16 hours of training. The Wahoo Tickr X can be connected to almost every iPhone or Android smartphone, but also a wide range of tablets and ANT+ enabled devices like for example cycling computers. Personally I use the Wahoo Tickr X in combination with my Pioneer Pedaling Monitor System (SGX-CA 500 computer and SGY-910HL power meter). Wahoo Tickr X comes in a small colorful box that includes the heart rate sensor, with a CR2032 battery installed. The package contains furthermore the adjustable soft strap that can be snapped on the Wahoo Tickr X heart rate monitor, a quick start guide and important product info guide. The heart and brain of the Wahoo Tickr X is the white unit that contains the Bluetooth 4.0 and ANT+ sensors. You directly notice the striking blue Wahoo logo with the dark blue X in it. The normal Wahoo Tickr doesn’t have this dark blue X, while the Wahoo Tickr Run has the characters run in dark blue on the right side of the logo. So visually you can see the difference between the three versions as well. You can see that the white front part is snapped onto the black backside in a firm and seamless way. When you push on the unit or try to torque it, it simply doesn’t bend and no creaking sounds can be heard. It simply feels like high quality assembly and product design. The back side of the Wahoo Tickr X is more interesting because it contains a lot of information. On the left and on the right you see the snap on buttons and note the cut-out that lock the elastic strap in one place (without rotating or movement). In the middle you have the housing for the CR2032 3V battery that powers the Wahoo Tickr X. With a coin you can open and close the housing, while lock-logo’s and an arrow visually show that the battery-door is locked. Furthermore there is information “printed” in the black plastic. Bluetooth and ANT+ logo’s in the left upper corner. In the left bottom corner you will find the 007-AC0099, while in the right upper corner you see FCC ID, Model number and IC number. In the bottom right corner you see the serial number as well as the CMIT ID and MSIP description. The normal Wahoo Tickr is a basic heart rate monitor, but still featuring the dual-band technology of Bluetooth 4.0 and ANT+. The Wahoo Tickr Run has four extra running specific features, like running smoothness, treadmill mode and running cadence. The Wahoo Tickr X is the only version with build-in memory that can store about 16 hours of training. 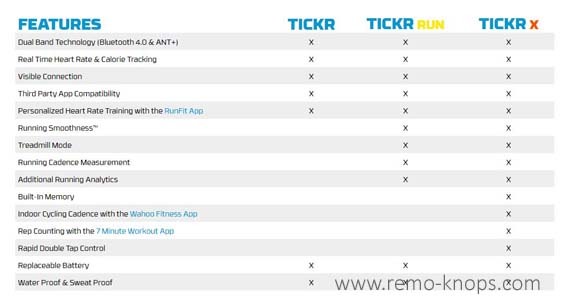 So if your Wahoo Tickr X isn’t connected to a smartphone for example, you can still do your running and sync your work-out afterwards. The motion sensors in the Wahoo Tickr X capture also cadence. The Pioneer SGX-CA 500 cycling computer directly captures the heart rate date during an exercise, where the Pioneer SGY-910HL power meter on the left Dura Ace 9000 crank captures the cadence. The build-in memory turns the Wahoo Tickr X into a data-collection-platform. Featured apps for various sport-types can be used in combination with a Bluetooth capable Android- or Apple smartphone. It started with the Polar Protrainer XT and the Polar heart rate sensor roughly 15 years ago, and over the years I have ridden with various brands of heart rate monitor (straps). The Wahoo Tickr X is among the most comfortable ones, even on long and hot summer rides of 5+ hours. Unique for the Wahoo Tickr series is the dual-band technology. Personally I mainly use the ANT+ protocol to connect with the Pioneer SGX-CA500 computer of my Pioneer Pedaling Monitor System. However I did some tests with the Wahoo fitness application on an Android smartphone. The pricepoint of the Wahoo Tickr X is currently around € 90,- while the normal Wahoo Tickr costs about € 50,-. So if you are not a data geek and not using the motion sensors, than go for the normal Wahoo Tickr model. If you are a frequent runner, than I would go for the Wahoo Tickr X (not the Wahoo Tickr Run). The motion analytics are more helpful for a runner, especially when training. I’m sure you can get cheaper ANT+ heart rate sensors, but the Wahoo Tickrs are well build and of good quality. You can replace the battery yourself (not needed) and you can get a spare strap for about € 20,- So overall the price points are fair for the value you get. If you are in the market to get a new or replace your current heart rate sensor, you should certainly put the Wahoo Tickrs on your short-list. 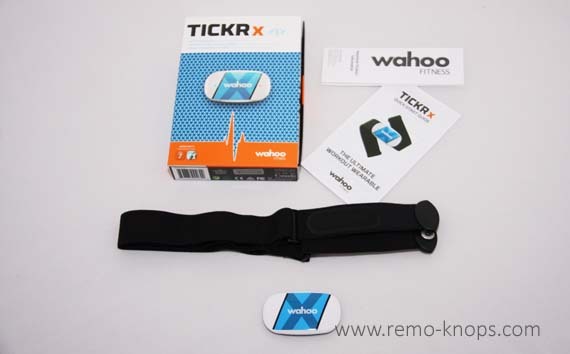 Hey!, I found this information for you: "Wahoo Tickr X review – Heart Rate Monitor with Motion Analytics". 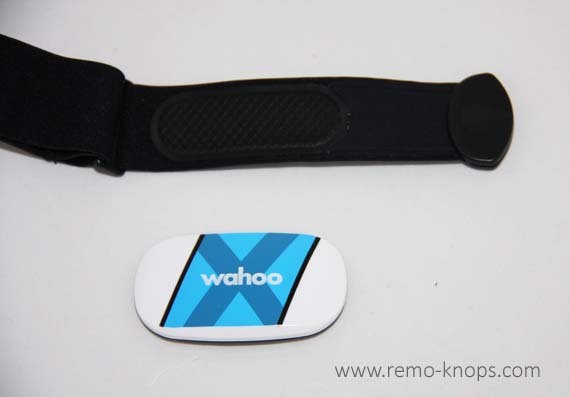 Here is the website link: https://www.remo-knops.com/5393/wahoo-tickr-x-review-heart-rate-monitor/. Thank you.